Angels in heaven, O Christ our Saviour,* sing of Your Resurrection,* enable us here on earth* to glorify You with a pure heart! Priest: Glory to the holy, consubstantial, life-giving and undivided Trinity, always, now and forever and ever. Христос воскресе із мертвих,* смертію смерть порпав,* і сущим во гробіх* живот даровав! Христос воскрес із мертвих,* смертю смерть подолав,* і тим що в гробах* життя дарував! Christ is risen from the dead,* trampling death by death,* and to those in the tombs* giving life! As smoke vanishes, so let them vanish as wax melts before the fire. So let the wicked perish at the presence of God, and let the righteous ones rejoice. This is the day that the Lord has made, let us exalt and rejoice in it. And to those in the tombs, giving life! We now sing the Paschal Canon of St. John Damascus. The clergy sing the Irmos of each Ode. The Choir leads the people in singing the troparia. Let all heaven burst with joy! * Let all the earth resound with gladness! * Let all creation dance in celebration! * For Christ has risen:* Christ our lasting joy! Christ is risen from the dead, trampling death by death, and to those in the tombs giving life! Irmos From barren rock behold the wonder! * The staff of Moses once drew water! * But we have something new to drink:* the drink of deathless life* from the rock that was His tomb;* for in Him is all our might! Now does light flood all creation:* heaven and earth, the world beneath! * Behold the festival of all creation:* Now we feast the risen Christ,* for in Him is all our might! Yesterday, my Christ, they buried me with You;* Today I rise with You! * Yesterday Your partner in death was I;* tomorrow, O my Saviour,* let me share the glory of Your realm! Katavasia From barren rock behold the wonder! * The staff of Moses once drew water! * But we have something new to drink:* the drink of deathless life* from the rock that was His tomb;* for in Him is all our might! Before the dawn, Mary and her friends approached the tomb,* and she found the stone removed. * and suddenly an angel spoke:* “Why look among the dead for one who lives in light eternal? Look, see the cloth with which they wrapped Him,* Go! Tell the world the Lord has risen, dealing death a death blow;* for He is God’s Son,* the Saviour of mankind! Irmos Let God’s prophet Habakkuk* now stand with us in godly vigil! * And show the angel radiant with light* whose voice gives forth the joyous news:* salvation visits the earth today,* for Christ has risen in His might! The first-born of the Virgin,* a small and tender infant,* as man he came among us! * But we called Him, “Lamb,”* pure and undefiled Pasch unblemished,* our real God the perfect One! Christ our Pasch was sacrificed,* yearling Lamb and crown of prophecy! * For all of us He freely died* and thus became the Pasch that purifies! * Upon us all resplendent sun our righteous Christ* has shown forth from the tomb! Before the ark symbolic,* God’s forebear David danced and leaped. * But we God’s holy people,* our eyes see all symbols now fulfilled. * For this God’s joy and gladness dance within us,* for Christ has risen in His might! Katavasia Let God’s prophet Habakkuk* now stand with us in godly vigil! * And show the angel radiant with light* whose voice gives forth the joyous news:* salvation visits the earth today,* for Christ has risen in His might! Irmos Now at daybreak* let us celebrate. * Let us gaze on Christ, our Sun of holiness. * Instead of spices,* let us offer Him our song* as He brings forth life for all! Hell’s captives saw Your endless loving kindness;* they fled with joy to You their Light:* and on their lips the happy news:* Christ our God has truly risen! * Clap your hands! Applaud the lasting Pasch! Come! Let us all go forth to meet Him! * Look behold our Christ triumphant who burst the tomb with glory,* God’s own Pasch, our soul’s salvation! * With angel hosts we celebrate* a festival of joy and gladness! Katavasia Now at daybreak* let us celebrate. * Let us gaze on Christ, our Sun of holiness. * Instead of spices,* let us offer Him our song* as He brings forth life for all! Irmos O Christ* You pierced the world beneath* and snapped infernal chains that bind forever! * But in three days You came forth from the tomb:* our Jonah from the belly of the whale! You left the seals of burial intact* in rising from the tomb, O Christ,* who left in birth the portals of virginity unbroken! * But heaven’s gates* You open wide to earth! O my Saviour! * Victim indestructible! * Our God, who freely gave Himself for us! * When You rose, O Christ, to God the Father,* You also raised up Adam and his race! Katavasia O Christ* You pierced the world beneath* and snapped infernal chains that bind forever! * But in three days You came forth from the tomb:* our Jonah from the belly of the whale! Although You went down into the grave, Immortal One,* You destroyed the power of hell! * You arose a mighty Victor, Christ our God,* bringing peace to Your apostles,* joy for the myrrh-bearing women;* and resurrection for the fallen! Before the dawn – as urgently as is in daylight – the women came with their spices to the tomb, looking for Him who existed before the sun was even created. That very Sun had come to set in a grave! They cried to each other: Bring your fragrant ointments, friends, and let us anoint that life-giving body which has been laid in a tomb. His is the body which raises the fallen Adam. Let us go! Let us hurry like the Magi; let us fall before Him in adoration. Let us offer myrrh to Him as He lays there wrapped, not in swaddling clothes, but in a shroud. Let us shed our tears and cry out to Him: Rise up, O Lord, give resurrection to the fallen! Rise up, O Lord, give resurrection to the fallen! We know no other than You. We call on Your Name. for behold, through the Cross joy has come to all the world. Jesus is risen from the tomb* as He foretold,* granting us eternal life* and great mercy! Irmos As He rescued three young men from furnace flames* by His passion* He has rescued us from death,* this One who took our flesh and suffered like all mortals. * He alone is blessed and full of glory:* the only God! * The One our Fathers knew! * Ever robed in splendid glory! Devoted women followed after You bearing fragrant spices to anoint You;* and though they mourned You first with many tears,* their gloom was turned to joy in finding You, their living God! * They spread the news to all Your friends, O Christ,* the joy and gladness of the mystic Pasch! Our feast today is death’s own death! * Hell is shattered! * A new and lasting life begins! * All joy and praise to Him who did this:* The only God — the one our fathers knew — ever robed in splendid glory! O how holy! How resplendent! * What a truly radiant night! * Brilliant birth of man’s redemption! * The harbinger of resurrection joy! * The night when boundless Light transfigured flesh* as Christ our God escaped the grave — dazzling splendour for the world! Katavasia As He rescued three young men from furnace flames* by His passion* He has rescued us from death,* this One who took our flesh and suffered like all mortals. * He alone is blessed and full of glory:* the only God! * The One our Fathers knew! * Ever robed in splendid glory! Irmos That hallowed and chosen day has come! * Of all holy Sabbaths the first and foremost:* the very expectation of the people of God. * The Festivals of festivals;* of all solemnities the greatest:* when all of us bless Christ forever! That hallowed and chosen day has come! * Let us share this joy divine! * Let us taste the vine’s new fruit* and share the lasting reign of Christ* when all of us bless Christ forever! Rise up, Sion, lift your eyes! * See your sons arrayed before you! * How they gleam with light divine! * From all the corners of the earth your scattered sons have found you:* They hasten to your bosom where all of us bless Christ forever! Glory to You, our God – most holy Trinity! Almighty Father, Word and Spirit,* Trinity of persons one in essence:* God most high, beyond our understanding! * In You have we been born anew,* for this do all of us bless You forever! 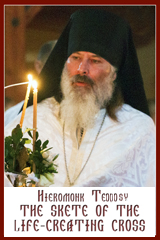 Deacon: Let us greatly extol in hymns the Theotokos and the Mother of Light! The Angel cried out to the One full of grace:* O chaste Virgin, rejoice! * And again I say, Rejoice! * Your Son has risen from the tomb on the third day,* and raised the dead. * Let all people rejoice! Irmos Shine, shine, O new Jerusalem! * for the glory to the Lord has risen upon you! * Exult now and be glad, O Sion! * And you, O chaste Mother of God,* take delight* in the resurrection of your Son. How divine! How mellow! The voice of purest love! *Your promise to remain with us, O Christ,* until the end of time! * Firmly do we hold to this promise,* the well-spring of our faith and joy! You are the greatest Pasch, O Christ, the holiest! * The Wisdom, Word and Power of God! * Your radiant presence, fuller ever lovelier manifest to us, O Lord* when You come again in glory* on the endless day when the sun will never set! Katavasia Shine, shine, O new Jerusalem! * for the glory to the Lord has risen upon you! * Exult now and be glad, O Sion! * And you, O chaste Mother of God,* take delight* in the resurrection of your Son. In the flesh You fell asleep like a mere mortal, O King, I King and Lord! But three days later You arose, lifting Adam from corruption, putting death to death. O Pasch beyond corruption, O Ransom of the world! Praise Him for His powerful deeds,* praise His surpassing greatness. We praise Your saving passion, O Christ! O praise Him with sound of trumpet,* praise Him with lute and harp. You captured Hades, O Christ. You raised us by Your own resurrection. Make us worthy to praise and glorify You in purity of heart. Praise Him with timbrel and dance,* praise Him with strings and pipes. O praise Him with resounding cymbals praise Him with clashing of cymbals. * Let everything that lives and that breathes give praise to the Lord. yet were not separated from the Father. You rose from the tomb, coming as from a bridal chamber to save the world. Let God arise;* let His enemies be scattered! Today a sacred Pascha is revealed to us. * A new and holy Pascha. * A mystical Pascha. * A Pascha worthy of veneration. * A Pascha which is Christ the Redeemer,* a blameless Pascha. * A great Pascha. * A Pascha of the faithful. * A Pascha which has opened for us the gates of Paradise. * A Pascha which sanctifies all the faithful. As smoke vanishes,* let them vanish. Come* from that scene, O women bearers of glad tidings,* and say to Sion:* Receive from us the glad tidings of joy* of Christ’s Resurrection:* Exult and be glad,* and rejoice, O Jerusalem,* seeing Christ the King* who comes forth from the tomb like a Bridegroom in procession! So let sinners flee from before the face of God;* but let the righteous rejoice! The myrrh-bearing women* at the break of dawn* drew near to the tomb of the LifeGiver. * There they found an angel* sitting upon the stone,* he greeted them with these words:* Why do you seek the living among the dead? * Why do you mourn the incorrupt amid corruption? * Go: proclaim the glad tidings to His disciples. Glory be to the Father, and the Son* and the Holy Spirit, now and forever and ever. Amen. If there be any devout people who love God, let them enjoy this splendid and radiant Feast. If any of them be wise servants, let them blissfully enter into the joy of their Lord. If any of them have laboured long in fasting, let them now receive their reward. If any have toiled from the first hour, let them now receive their just wage. If any came at the third hour, let them gratefully join in the Feast. If any arrived at the sixth hour, they should not be afraid, for they will not be deprived of anything. If any of them tarried even until the ninth hour, let them approach without hesitation. If any arrived only at the eleventh hour, they should not worry on account of their tardiness. For the Master loves to grant honours and will receive the last just as the first. He gives rest to the one who came at the eleventh hour, just as He does to the one who toiled from the first hour. He shows His mercy to the last, and His care for the first. To the one He gives; on the other, He showers gifts. He accepts deeds and welcomes intentions. He honours labours and praises resolutions. And so, let all enter into the joy of their Lord, and let the first as well as the last receive the reward. Let the rich and the poor celebrate together. Let the resourceful and the slothful honour this Day. Let those who fasted and those who did not fast be glad today. The Table is bountifully set; let all be satisfied. The Calf is fattened; let no one go away hungry. Let everyone enjoy the Cup of Faith. Let everyone receive the richness of Grace. Let none grieve at their poverty, for the Kingdom that belongs to all people has been revealed. Let none weep for their sins, for forgiveness shines forth from the Tomb. Let no one fear Death, for the Saviour’s death has set us free. The One Whom Death imprisoned has extinguished Death. The One Who descended into Hades made Hades the captive. He caused it distress when it tasted His Flesh. When Isaiah foresaw this, he exclaimed: “Hades was all distressed by encountering You in the nether world.” It was distressed because it was abolished. It was distressed because it was mocked. It was distressed because it was slain. It was distressed because it was overthrown. It was distressed because it was chained. It seized a Body but discovered God. It seized the Earthly but encountered the Heavenly. It seized the Visible but was overcome by the Invisible. O Death, where is your sting! O Hades, where is your victory! Christ is risen, and you are abolished! Christ is risen, and the demons are cast down! Christ is risen, and the angels rejoice! Christ is risen, and Life now reigns! Christ is risen, and the Tomb is emptied of the dead! For in rising from the dead, Christ became the First-Fruits of those who have fallen asleep. To Him be glory and power for ever and ever! Amen. 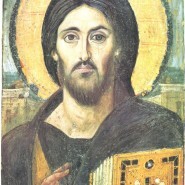 The grace that shines forth from your mouth like a torch has enlightened the universe;* it implanted in the world the treasure of the love of poverty,* it showed us the high value of humility;* instruct us by your words, John Chrysostom, our father,* and intercede with the Word, Christ God,* for the salvation of our souls! Shout to the Lord, all the earth,* sing now to His name, give glory to His praise. Through the prayers of the Mother of God,* O Saviour, save us. Let all the earth worship You and sing to You,* let it sing to Your name, O Most High! Let God arise, and let His enemies be scattered; let those who hate Him flee from before His face. Troparion: Christ is risen from the dead,* trampling death by death,* and to those in the tombs* giving life. As smoke vanishes, let them vanish, as wax melts before the fire. So let sinners perish before the face of God, but let the righteous be glad. In the churches bless God, the Lord from the fountains of Israel. Kontakion, Tone 8: Though You descended into a tomb, O Immortal One,* yet You destroyed the power of Hades;* and You rose as victor, O Christ God,* calling to the myrrh-bearing women: Rejoice! * and giving peace to Your Apostles:* You, who grant resurrection to the fallen. You have put on Christ! Alleluia! All you who have been baptized into Christ, you have put on Christ! Alleluia! This is the day which the Lord has made;* let us rejoice and be glad in it. verse: When you rise, You will have compassion on Sion. Receive the Body of Christ;* taste the fountain of immortality. * Alleluia, alleluia,* alleluia. Priest: Let God arise, and let His enemies be scattered; let those who hate Him flee from before His face! Priest: As smoke vanishes, let them vanish, as wax melts before the fire! Priest: So let the sinners perish before the face of God, but let the righteous be glad! Priest: This is the day that the Lord has made. Let us rejoice and be glad in it! Priest: Glory be to the Father, and to the Son, and to the Holy Spirit, now and for ever and ever. Amen. All: And to those in the tombs giving life. Come, let us worship Him who was born of the Father before all ages. and has saved me who had been lost. I have waited for You as You have commanded;*my soul patiently relies on Your promise,* for it has trusted in the Lord. wiped out the sentence written against us. He wiped it out and abolished the might of death. before His resurrection on the third day. to judge the world He Himself created. Come and see where the Lord was laid. He is risen as He had foretold. By Your cross You abolished the curse of the tree. and by Your resurrection You enlightened humankind. O Christ our God, the Benefactor, glory to You! Strong is the love of the Lord for us;*eternally will His truth endure. and when the gate-keepers of Hades saw You, they trembled. the shadow of the Law passed away with the realization of grace. Who is so great a God as our God? * Thou art the God who doest wonders! verse: Amongst the people hast Thou made Thy power known! verse: And I said: now have I made a beginning: this change has been wrought by the right hand of the Most High. verse: I have remembered the works of the Lord, and called to mind Thy wonders from of old. has lighted up the whole universe. O Lord almighty, glory to You! Priest: Blessed is the One-Who-is, blessed is Christ our God, always, now and forever and ever. All: Amen. O God, strengthen the orthodox faith forever and ever. Priest: O most holy Mother of God, save us. Priest: Glory be to You, O Christ our God, our hope, glory be to You! All: Christ is risen from the dead, trampling death by death, and to those in the tombs, giving life. Lord, have mercy. (3) Give the blessing! Priest: Christ is risen from the dead, trampling death by death, and to those in the tombs, giving life, through the prayers of His immaculate Mother, of the holy glorious and all-praiseworthy Apostles, of our venerable god-bearing fathers, of Saint N., patron of this temple, of Saint N., whose memory we celebrate this day, and of all the saints, will have mercy and save us, for He is good and loves mankind. Літургійні рубрики: Після того, як священик виголошує “Благословенне Царство” й люди відповідають “Амінь”, священики співають Тропар один раз, а люди його повторюють. Далі священики співають першу половину, а люди завершують другу. Так робимо щодня, аж до середи перед четвергом Вознесіння. Христос воскрес із мертвих, смертю смерть подолав, і тим, що в гробах, життя дарував (х3). Стих 1: Воскликніте Господеві, вся земле! Співайте ж імені його, віддайте славу хвалі його (Пс 65,2). Стих 2: Скажіте Богові: Як страшні діла твої, задля великої сили твоєї підлещуються тобі вороги твої (Пс 65,3). Стих 3: Вся земля нехай поклониться тобі і співає тобі, нехай же співає імені твоєму, Всевишній (Пс 65,4). Стих 1: Нехай воскресне Бог і розбіжаться вороги його, і нехай тікають від лиця його ті, що ненавидять його (Пс 67,2). Стих 2: Як іщезає дим, нехай іщезнуть, як тане віск від лиця вогню (Пс 67, 3). Стих 3: Так нехай погибнуть грішники від лиця Божого, а праведники нехай возвеселяться (Пс 67,3-4). В церквах благословіть Бога, Господа, ви – з джерел ізраїлевих (Пс 67,27). Кондак (глас 8): Хоч і у гріб зійшов ти, Безсмертний,* та адову зруйнував ти силу,* і воскрес єси як переможець, Христе Боже,* жінкам-мироносицям звістивши: Радуйтеся,* і твоїм апостолам мир даруєш,* падшим подаєш воскресіння. Ви, що в Христа хрестилися, у Христа зодягнулися. Алилуя! Це день, що його створив Господь,* возрадуємося і возвеселімся в нім (Пс 117,24). Стих: Сповідуйтеся Господеві, бо він благий, бо на віки милість його (Пс 117,1). Стих: Ти, воскресши, помилуєш Сіона (Пс 101,14). Стих: Господь з неба на землю споглянув (Пс 101,20). Споконвіку було Слово, і з Богом було Слово, і Слово було – Бог. З Богом було воно споконвіку. Ним постало все, і ніщо, що постало, не постало без нього. У ньому було життя, і життя було – світло людей. І світло світить у темряві, і не пойняла його темрява. Був чоловік, посланий Богом, ім’я йому – Йоан. Прийшов він свідком – свідчити світло, щоб усі з-за нього увірували. Не був він світло – був лише, щоб свідчити світло. Справжнє то було світло – те, що просвітлює кожну людину. Воно прийшло у цей світ. Було у світі, і світ ним виник – і світ не впізнав його. Прийшло до своїх, – а свої його не прийняли. Котрі ж прийняли його – тим дало право дітьми Божими стати, які а ім’я його вірують; які не з крови, ані з тілесного бажання, ані з волі людської, лише – від Бога народилися. І Слово стало тілом, і оселилося між нами, і ми славу його бачили – славу Єдинородного від Отця, благодаттю та істиною сповненого. Свідчить про нього Йоан, і проголошує, промовляючи: «Ось той, про кого я говорив: Той, що йде за мною, існував передо мною, був раніше за мене.» Від його повноти прийняли всі ми – благодать за благодать. Закон бо був даний від Мойсея, благодать же й істина прийшла через Ісуса Христа. Ангел сповіщав Благодатній: Чистая Діво, радуйся. І знову кажу: Радуйся. Твій Син воскрес тридневний із гробу, і мертвих воздвигнув він; люди, веселіться. Ірмос (глас 1): Світися, світися, новий Єрусалиме, слава бо Господня на тобі возсіяла. Радій нині і веселися, Сіоне. А ти, Чистая, красуйся, Богородице, востанням рождення твого. Тіло Христове прийміть, джерела безсмертного споживіть. Алилуя (х3). Замість Благословен, хто йде в ім’я Господнє: Христос воскрес із мертвих, смертю смерть подолав, і тим, що в гробах, життя дарував. Замість Ми бачили світло істинне: Христос воскрес із мертвих, смертю смерть подолав, і тим, що в гробах, життя дарував. Замість Нехай сповняться: Христос воскрес із мертвих, смертю смерть подолав, і тим, що в гробах, життя дарував (х3). Замість Будь ім’я Господнє: Христос воскрес із мертвих, смертю смерть подолав, і тим, що в гробах, життя дарував (х3). Тоді знову співається Тропар “Христос воскрес”, як і на початку Літургії, але з додатковим закінченням. Тропар: Христос воскрес із мертвих, смертю смерть подолав, і тим, що в гробах, життя дарував (х3). І нам дарував життя вічне, поклоняємось його тридневному воскресінню.